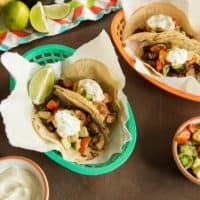 Mushroom Tacos with Tomato Avocado Salsa | Good. Food. Stories. Fair warning that when you write those words, your friend Lauren might actually take you up on that suggestion. 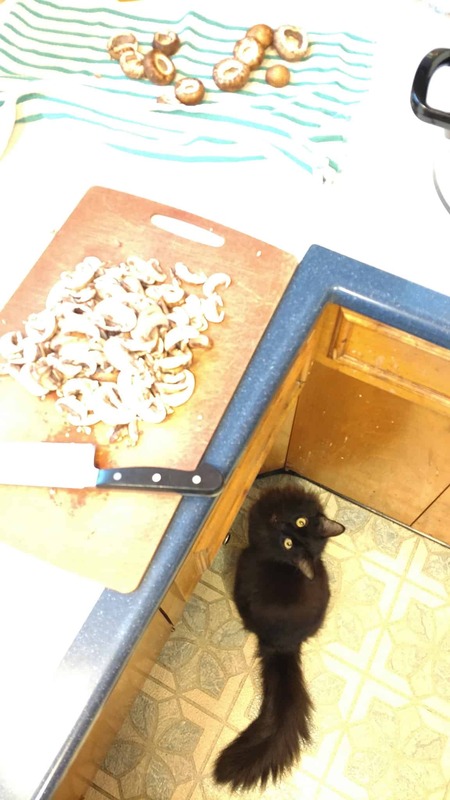 Today marks the one-year anniversary of when Bixby came to live with us, so it’s time to continue the tradition of telling tails—er, tales—about my cats by sharing his origin story—and a recipe for mushroom tacos that he’d love to eat if he were allowed. 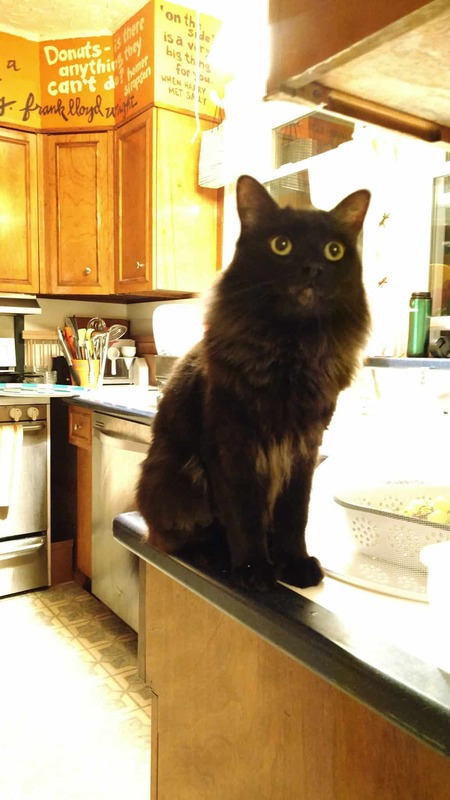 Abandoned on the sidewalks of Sherman Oaks, the velvet floofball now known as Bixby was discovered and rescued by generous cat lovers Kasey and Grant, who already had two gorgeous housepanthers of their own. They needed to find him a forever home, so they did what we all do in this day and age: plaster all social media networks with virtual posters. And their friends, including fellow crazy cat lady Lauren, spread the word. I saw Lauren’s Facebook post, made a half-joking comment, and set in motion a whirlwind plan that—thanks to a hell of a lot of Kasey and Grant’s airline miles—got Lauren and Bixby across the country, racing against a snowstorm with a layover in Minneapolis, to our doorstep just in time for the holidays. There’s a first time for everything, including picking a cat up at the airport. Bixby arrived with a lot of nervous purr energy and timidity that quickly turned to inquisitive exploration after only 48 hours in his new home. 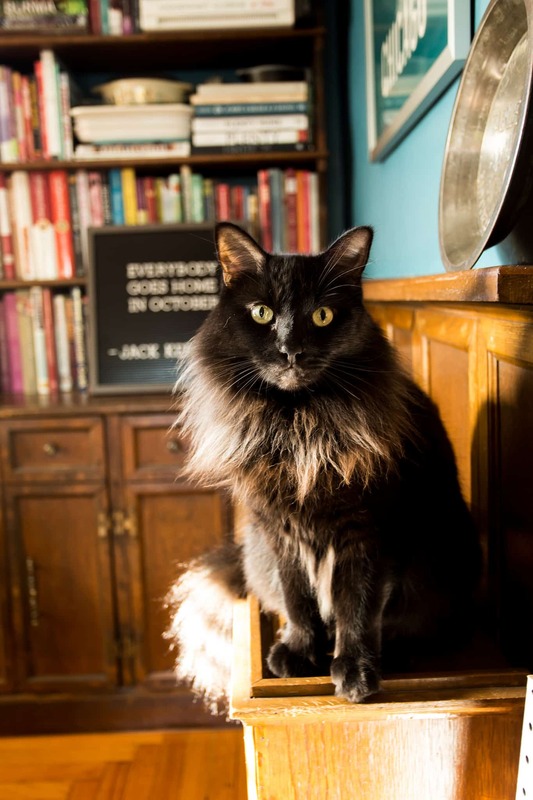 And like his predecessor Harry, Bixby has become my little shadow in the kitchen. Fearless in his ascent of the counters, the top of the refrigerator, and the big Breville toaster oven (even when it’s still hot from recent use! ), this little owlbat has serious ninja skills. After finding tiny vampire fang marks puncturing our avocados, tomatoes, peaches, and plums, we’ve been forced to devise a series of safeguards to protect our produce from Bixby’s chomp attacks. Baskets hanging from the ceiling just out of paw reach and mesh domes for food on the counter are now par for the course, along with even more food in Mason jars, since he can tear through plastic with his jaws. Along with his experimental nibbles of produce (within reason; Bixby vs. Watermelon did not work in the cat’s favor), the other two foods that make Bixby go craaaazy are mushrooms and yogurt. Mushrooms? Yep, mushrooms. I don’t let him indulge in those, but he’s most definitely become a plain Greek yogurt aficionado. He can recognize the sound of the lid separating from the rest of the plastic container and comes bounding into the kitchen on his fluffy little trotters to accost me with plaintive mews until I give him a fingerful of yogurt. As far as I’m concerned, Bixby can have all the yogurt fingys he demands. After losing Harry, I didn’t know if or when I’d be ready for another cat, but as it turns out, Bixby made that decision for me. 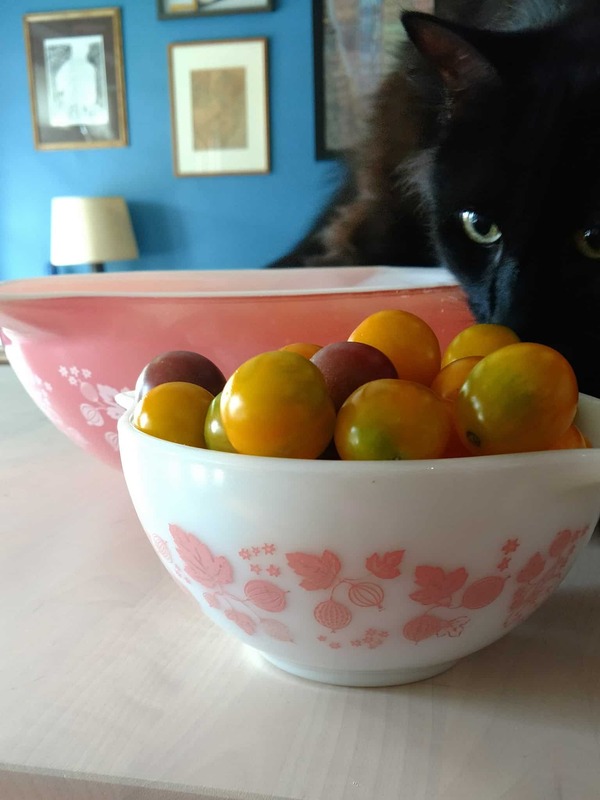 In his honor, I’ve created a recipe that uses all his “favorite” ingredients, because the best thing to do when your cat is trying to eat everything on your counter is to quickly cook it up and eat it yourself. 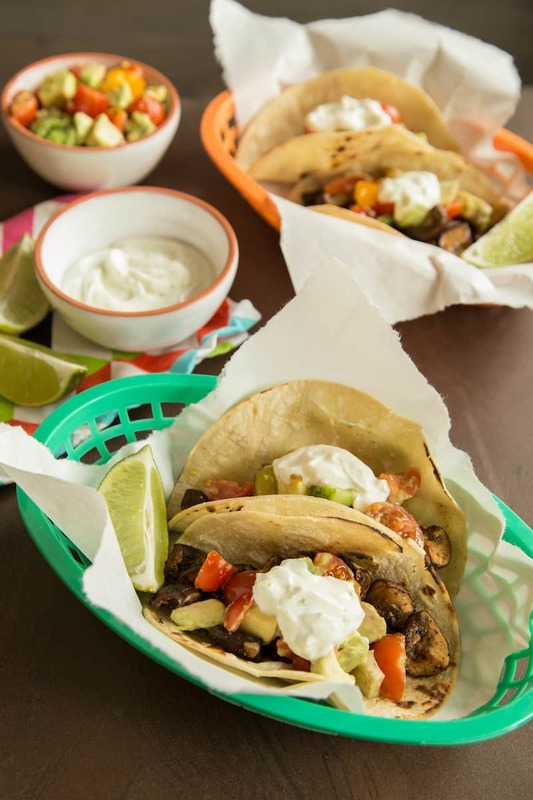 Mushroom tacos are a wonderfully hearty - and quick - vegetarian meal option. Add tomato-avocado salsa and Greek yogurt crema to keep it healthy. Stir the yogurt and lime zest together in a small bowl. Rinse and quarter the tomatoes, and dice the avocado. Stir the tomatoes and avocado together in a medium bowl with the lime juice and 1/2 teaspoon kosher salt. Clean and de-stem the mushrooms, and quarter each cap. Heat the largest skillet you own over medium heat—if you don't have a 12-inch skillet, you will likely have to cook the mushrooms in two batches, halving the ingredients as necessary. Heat the oil in the skillet, then add the mushrooms in a single layer, tossing to coat with the oil and making sure the mushrooms are not crowded in the pan. Cook without stirring for 4-5 minutes, then stir and continue to cook for another 3-4 minutes, making sure the mushrooms brown well on all sides. While the mushrooms cook, stir the remaining 1/2 teaspoon salt, chipotle powder, cumin, coriander, and pepper together in a small bowl. When the mushrooms are well browned but still meaty in texture, add the spice mixture and the minced garlic. Stir continuously to coat the mushrooms and cook the garlic for about 1 minute. 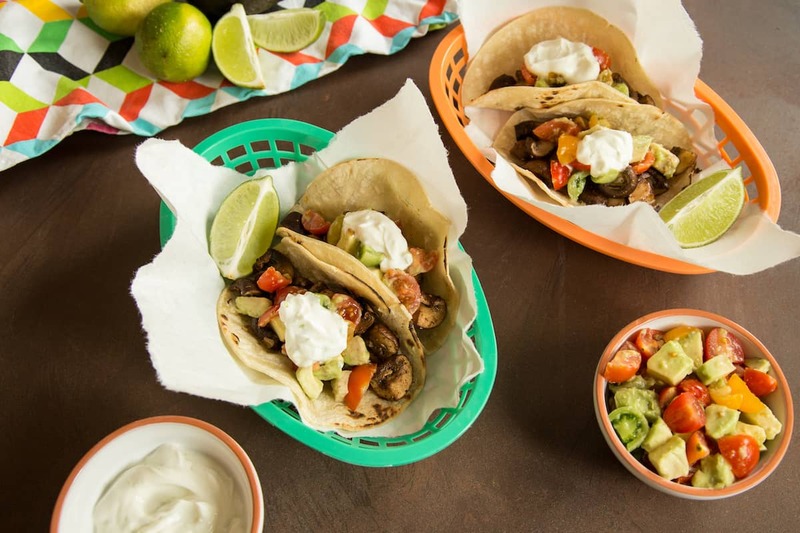 Heat the tortillas and fill each with a few spoonfuls of mushrooms, salsa, and crema. Serve immediately before the cats sink their fangs into the tacos.